Instantaneously chills milk to 8o C with a flow rate of 350 litres/hour. Promethean’s Rapid Milk Chiller Premium is a modular milk chilling system that can cool from 35o to 4o C without a diesel generator. The system cools in 2 stages. First the milk is poured on the Rapid Milk Chiller which instantaneously chills the milk to 8o C with a flow rate of 350 litres/hour. The chilled milk is then stores in the SS tank which cools the milk gradually to 4o C. The capacity of the system is 1000 litres/day and it works even if there is no power during the milk collection by using only 4 hours of intermittent grid power between each milking shift. The Rapid Milk Chiller Premium is an ideal solution for customers who are looking to collect the highest quality of milk. The combination of Rapid Chiller with the SS tank helps in both cooling the milk instantaneously as well as maintaining the low temperature. 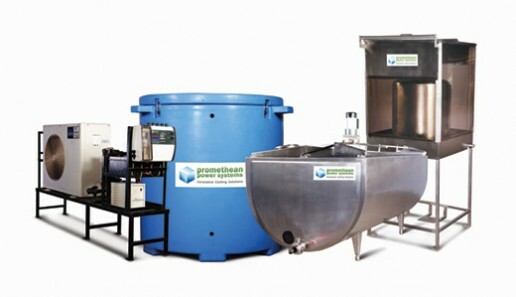 By eliminating DG set, Promethean Milk Chiller provides the most cost effective way of collecting top quality chilled milk from village milk collection centers where grid power is erratic. Dairies have to invest in a cold chain for distribution of pouch milk to reduce the risk of spoilage. This adds a cost of nearly Re. 1/litre for the dairy. As the shelf life of the pouch milk is 2-3 days, this means that the distribution could not spread out far beyond the processing centres; and the reach of the dairies into deep rural markets was limited. Heritage Foods worked on the solution of using UHT milk to solve both the above problems. As UHT milk could be transported at ambient temperature the cold chain costs were saved. Moreover the shelf life of the UHT milk was nearly 7 days, which gave enough time for their channels to reach the milk into rural markets. Production of UHT milk requires the raw milk collected by the dairy to be a very good quality in order to lower production costs and give more shelf life. Heritage Foods was seeking a solution which not only delivered high quality milk but would also keep the costs under control, as the UHT milk would have to be sold in the market at the same rate as the pouch milk. Promethean Power Systems and Heritage Foods worked together to develop the Rapid Milk Chiller Premium as the ideal solution which met both of the dairy’s needs. The Rapid Milk Chiller Premium based on the Thermal Energy Storage technology has a 2 stage cooling process. In stage 1 the Rapid Milk Chiller lowers the temperature of milk from 35o to 8o C within seconds. This eliminates most of the bacteria. In stage 2 the chilled milk is then poured into an active cooling tank which reduces the temperature of the milk gradually to 4o C. The Thermal Storage Solution is charged using the intermittent grid supply whenever it is available. The chilling is not dependent on the grid availability and is highly cost efficient and eco-friendly as it eliminates the use of a Diesel Generator. Post installation of Promethean’s Rapid Milk Chiller Premium solutions in their village collection centres the MBRT of the milk collected by Heritage Foods has increased from 1 ½ hours to 4 ½ hours. The elimination of diesel has also meant that chilling costs are under control.